Mega Moolah is an exceptional 5 reel, 25 payline online slot game that gives you the chance to win a huge amount of moolah. This is one of the first progressive jackpot games developed by Microgaming and since emerging on the market has only embedded itself as a cult favourite for all the serious online slots players. Microgaming one of the leading suppliers of online casino uk gaming software is a game development team based in the Isle of Man, and are. Their products include Casino, Multi-player, Mobile, Poker and more. They have created more than 850 unique casino games with 1,200 variants. In 1994, Microgaming created one of if not the first online casino. Mega Moolah is a progressive slot videogame from the developers Microgaming with 5 reels and 25 pay-lines. This slots online casino has deep jungle theme with a large presence of wild animals such as; an Ibis, Zebras, Giraffes, Buffalo, Elephants, and a lion, offering you several features as well as fast gameplay. The backdrop is verdant greenery and apart from the standard 10, J, Q, K and A, the special symbols are all jungle-related. Before playing, you must set your bet using the “ / -“ buttons, you can set the coin size (0.01, 0.02, 0.03, 0.04, 0.05) “Select Coins” is used to set the number of coins that you wish to bet per line (1 ,2 , 3, 4 or 5) . Using the “Select Lines” function, you can set the number of pay-lines available to win on. Choosing the Spin button will start the game and potentially your chance to win. The Scatter Symbol is represented by the Monkey symbol and the Wild Card Symbol features a Lion. The Scatter Symbol triggers free spins when it appears on any of the reels, and 3 or more scatters will trigger the Free Spin Mode which awards 15 Free Spins. All wins during Free Spin Mode are tripled, and if the player gets 3 or more Scatter Symbols during their free spins, they are awarded another 15 free spins on top of the original free spins with a maximum of 30 free spins. The Wild Card can replace any symbol on the reels except the scatter, and when triggered rewards the player by doubling their win (If it is triggered on a winning spin). In order to activate Mega Moolahs’ “Auto Play” feature, the player must enable “Expert Mode”. This allows the game to play itself for a predisposed number of turns, wins or losses, meaning that the player can just sit back and watch the reels spin. 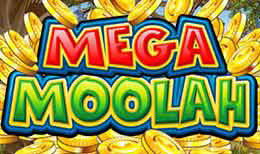 In Mega Moolah, there is a Randomly Triggered Bonus event with 4 progressive jackpots. The Player must try their luck and spin a wheel for the chance to win big with one of the 4 available progressive jackpots. The four available jackpots are as follows; The Mega Progressive Jackpot, starting at 1,000,000 coins; The Major Progressive Jackpot, starting at 10,000 credits; The Minor, beginning at 100 coins, and the Mini Progressive Jackpot, which awards the player 10 coins. These jackpots go up as you play the game, meaning that the more you put into the game, the higher the jackpots get, and the more you could be rewarded with in the end. This game is a jungle themed slots game with great visuals and music that suit the theme of the game. The progressive jackpots are a nice concept, allowing the game to stand out from other slots games. All in all, I’d say that Mega Moolah is a fun, addictive game that grants the player a varied gaming experience. Want to try your luck? Play this game and let luck do the rest.